LONDON — They introduced Justin Gatlin to the Olympic Stadium crowd here Sunday evening, just before they put a gold medal around his neck, before The Star-Spangled Banner played in his honor, and along with some cheers a chorus of boos rang out. The cheers — great. The boos — this fell somewhere between disappointing and reprehensible. Olympic-style sport is not the English Premier League, the NFL or NBA. It is supposed to be about promoting three key values: friendship, excellence and respect. Saturday’s men’s 100-meter final immediately became arguably the biggest gold-medal victory in the history of the event. Gatlin defeated the sport’s biggest legend, Jamaica’s Usain Bolt. It’s how the race will forever be remembered: who beat Bolt, and in Bolt’s last individual 100? Gatlin. And who, before Saturday, was the last guy ever to beat Bolt? Gatlin, in Rome in 2013. None of that takes anything away from Bolt. It does, however, catapult Gatlin. The two respect each other, unequivocally. The sport’s establishment and significant segments of the British media nonetheless remained fixatedSunday on the same tiresome narrative (cue boos): Bolt and Gatlin as a clash of good and evil, even though that narrative holds no factual support. How about — the truth? The truth does not care about demonizing a champion for the sake of a grotesque caricature of a narrative. Instead, the truth turns to a real story about a real person who learned to overcome, as all of us must, to succeed. It includes, in measure, acceptance, gratitude, humility and, centrally, love. With love — for each other and what we do — anything is possible. The truth tells us all how Justin Gatlin went from despair to what destiny had in store for him Saturday night in 9.92 seconds. On July 4, Gatlin ran a 9.98 for the win in the 100 at a meet in Budapest. That night, he, along with his longtime coach, Dennis Mitchell, and Dave Pascal, a Cary, N.C.-based chiropractor who focuses on severe neurological injury and whose practice also includes an extensive sports background, piled into a van to drive to Vienna. Pascal's track roster includes a host of other superb U.S. athletes, including Sunday's women's 100 winner, Tori Bowie. Mitchell was riding shotgun; Pascal in the middle bench of the three rows; Gatlin in the way back, on the driver’s side. Twenty minutes into a two-and-a-half hour trip, on a pitch-black two-lane road, a truck traveling in the opposite direction crossed the center line. Both vehicles were traveling roughly 70 miles per hour. That’s a combined closing speed of 140. Mitchell saw the crash coming. He knew the truck did not have enough time to get all the way back onto the right side of the road. He slumped back into his seat, resigned to whatever was next. A head-on crash? No. At the last possible moment, the truck, in fact, slid over — just enough. The driver of the van slowed and then pulled over by the side of the road to assess the damage. The driver’s side mirror — gone. Truck from the paint ran down the side of the van, heaviest just outside the third window, right where Gatlin had been. Everyone was sick to their stomachs. Everyone called home. Everyone was alive. Two nights later, on July 6, Gatlin ran in one of the sport’s traditional summer highlights, a meet in Lausanne, Switzerland. Gatlin won, in 9.96. That was his final tune-up before London. The cosmos whisper to us. The trick is to listen. Gatlin’s first positive test was for Adderall, which he assuredly was not hiding, in 2001. His second, in 2006, was for testosterone; how it got into his system remains entirely unclear, according to a voluminous record on file in federal court in Florida. To call for lifetime bans for doping offenses, as some did here Sunday, ignores the World Anti-Doping Code rules that since 2015 include assessments of intent and proportionality. Ask Gil Roberts, who won a gold medal as a member of the U.S. 4x400 relay team last year in Rio; on July 10, an arbiter ruled he had ingested the masking agent probenecid unknowingly by “frequently and passionately” kissing his girlfriend just hours before a March 24 test; she had swallowed sinus medication powder; this was thus not a case of intentional doping. In the doping arena, facts, rules and process matter. During the four years he was ordered to take off, 2006 to 2010, one of the things Gatlin did was train 8-year-olds in Atlanta. It is a long way from training 8-year-olds to defeating Usain Bolt on the world stage. “It takes a special person to endure all this,” Gatlin's longtime agent, Renaldo Nehemiah, said Sunday. After connecting with Mitchell, Gatlin worked his way back to bronze in the 100 here in 2012 in London, behind Bolt of course. Then at the 2013 worlds, silver, again behind Bolt. The 100 at the 2015 worlds in Beijing should have been Gatlin’s race. He came in on a hot streak — including a 9.74 that May at a race in Doha, Qatar. That Beijing 100, however, went Bolt’s way, by one-hundredth of a second, Bolt crossing in 9.79, Gatlin breaking form about five meters from the line and finishing in 9.8. In Beijing, the good vs. evil theme got big play. That is, he said, he was running perhaps too selfishly — he wasn’t feeling part of something bigger, at least enough to make a difference. Last year, in Rio, Gatlin again took silver, behind Bolt. Gatlin has said many times since that he was injured in 2016. Nehemiah said Sunday it was something even more. About three weeks after the Games, Nehemiah said, he called Gatlin and said, what happened? You faded at 80 meters — that’s not like you. Gatlin is not one to complain. Even with Nehemiah — with whom he has worked since 2003 — he is not an excuse-maker. Food poisoning, Gatlin said. I was sick the entire time I was in Rio. This 2017 season did not start auspiciously. Gatlin, who turned 35 in February, battled a succession of injuries. On May 5 and May 21, Gatlin ran two races in the 10s. On May 27 at Hayward Field in Eugene, Oregon, which is a fast track, he ran a wind-aided 9.97, good only for fifth — with the U.S. nationals, and a spot on the line for the worlds, coming up just three weeks later. After the first round of heats at the nationals in Sacramento, California, Gatlin texted Pascal. The two had first started working together in 2003. This is the nature of Gatlin’s world — a close inner circle and longstanding relationships. With Pascal, the work has not been every year. But now Gatlin was again reaching out, asking if they could connect while simultaneously offering a heartfelt apology for wrongs he might have committed over the course of their years together. “He deeply apologized,” Pascal said, “then he said he was hoping we could work together that day. I said, yes, of course. “If you look at his form, to me, I’m biased, in his semifinal, he looked dramatically better and his final he won,” Gatlin going 9.95, NCAA champion Christian Coleman 9.98. That had maybe taken care of Gatlin’s physical connection. Now — emotionally and mentally? Before the race, Mitchell had turned to Gatlin. Understand that Mitchell is not the sort who demands of his athletes, I need x or y. This time, though, he said to Gatlin, I need 9 seconds. Mitchell added, “It’s a love story,” in part the love the two men had for each other after all they had been through and in part their shared passion for the sport. No one in the Gatlin circle is uncomfortable speaking like this. They love track and field. They love competing. “Gat gave me — his love for track and the person he is gave me back my love for track,” Pascal said. That near-death experience on the highway in Europe? Gratitude for being alive. Humility that everyone had been given more time. The sense that there had to be a reason. Right? Why else? “Spiritually,” Nehemiah would say Sunday, “it wasn’t his time the last two seasons. Bolt came into London ranked only seventh in the world. Coleman was the world No. 1, with a 9.82 in Eugene at the NCAAs. Team Gatlin had something of a stealth plan through the rounds: just do enough to get to the finals. No need to run too fast. Which is exactly what Gatlin did, a 10.05 in the heats, then a 10.09, second in his semifinal, enough to get through to the final, where he drew Lane 8 — way out on the outside. Bolt drew Lane 4, Coleman 5. When Gatlin lined up, the boos rained down. Each and every round. In the final, when the gun went off, Gatlin’s mind was calm. He was not running solely for himself. He was, he said, running for, in no particular order, Pascal; for the USA Track & Field medical staff; for Nehemiah; for Mitchell; for the crew he trained with day in and out in Clermont, Florida; for his U.S. teammates here and in years gone by; for fans here and at home; for his family; for anyone and everyone who had supported him on this journey. A moment later, he bowed to Bolt, out of — genuine — respect. They embraced, again out of — real — respect. 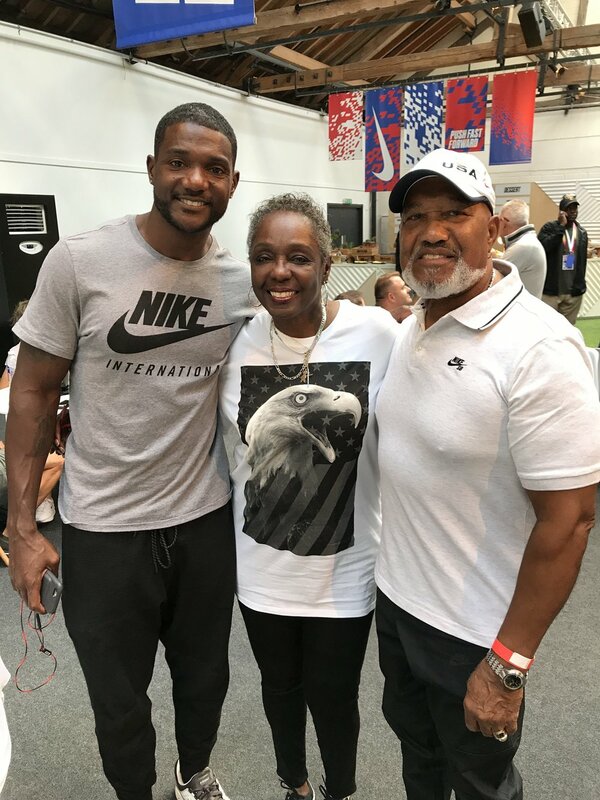 Then, while the crowd chanted Bolt’s name, Gatlin, wrapped in the American flag, went over to the side of the stadium, to find his parents, Willie and Jeanette.